» Perhaps permanently abandoning hopes for an extension of the Tren Urbano, San Juan proposes light rail program. Implementation would coincide with a massive redevelopment of the Isleta and Old San Juan. The enormous increase in construction costs for the Tren Urbano, which opened in late 2004, likely doomed any serious short-term hope of extending the rail corridor’s reach into San Juan’s historic center. What was supposed to be a $1.25 billion rapid transit line carrying well over 100,000 riders a day somehow morphed into an exercise in under-performance, with only 40,000 daily passengers transported on a guideway that cost $2.5 billion to build, arguably making it the most expensive North American public transportation project of the early 2000s. The 10.7-mile Tren Urbano — an automated, metro-class train system — has an extension north to Miramar on the books. But the enormous expense of building such a project and the limited patience of the Federal Transit Administration, which offered up much of the initial funds, has encouraged local efforts to try something else. San Juan Mayor Jorge Santini’s proposal is his Walkable City plan, released last week with the goal of advancing up to $1.5 billion of redevelopment on the city’s Isleta thanks to a $400 million investment in a light rail connection between the Tren Urbano terminus at Sagrado Corazón and Old San Juan. In addition to spurring 16 million square feet of new buildings, the 5.3-mile Tren Liviano (light rail) would induce a population explosion, expanding San Juan island’s citizenry from 8,000 today to almost 25,000 (the city overall has more than 400,000 inhabitants). Mayor Santini projects that the transformation could be completed in fifteen years. The light rail line would run in its own right-of-way and require the conversion of several streets to pedestrian and transit malls; stops would be located less than half a mile apart. Construction could theoretically proceed in two phases: First, from Old San Juan to the Convention Center along 2.1 miles of route, then second to Sagrado Corazón. It may be foolish to build another form of rail transit in a city that has been reluctant to accept what’s already in operation. The projections of 40,000 daily users for the light rail line could be just as optimistic as were those for the Tren Urbano ten years ago. It’s always problematic to force riders to transfer between modes during their daily commutes. And there are certainly aspects of this transit proposal, such as a confusing and inefficient loop around facilities in the Convention Center area, that could use refinement. Serious proposals for a light rail extension into the oldest part of Puerto Rico’s largest city have been around since 2007. San Juan had streetcars in the past, though they were torn up as automobile commuters increased their influence. There are currently no sources of funds for any of the projects being considered. Yet the effort to articulate the train program as an integral element of a larger attempt to shape development in San Juan is intriguing and potentially vital to defending the importance of its future construction. 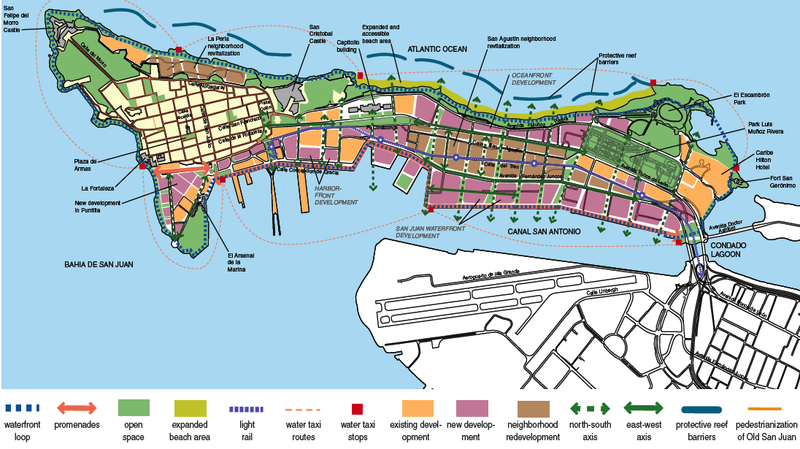 The mayor’s proposal makes a strong point: Showing how a full-scale reconstruction of the Isleta could proceed, the document argues that the opening of the light rail and its five stations along the island would coincide with the development of a waterfront promenade, a pedestrianization of many areas in Old San Juan, and the revitalization of the now-poor San Agustin district. Mayor Santini’s proposal is to fundamentally remake the look and feel of the current city through the provision of alternative transportation offerings. The plan would improve the city’s physical environment with an emphasis on livable urbanism. It is this direct integration of transportation and land use goals that makes San Juan’s project especially interesting. If the two efforts are to be addressed together — as they always should be — then a change in thinking on one issue must be followed by a reevaluation of the other. San Juan may or may not find the funds to complete a light rail line into its oldest neighborhoods, but if it ever does, it will have a strong framework for plotting out related future growth. The tren urbano is like the miami metrorail, it cant attain predicted ridership until it reaches key locations. Light rail in old san juan (and condado) is a must, but tren urbano needs to at least reach miramar. with tren urbano they should have built their way outward from the city towards the suburbs versus what they did by building inward from the suburbs. if theres one place for heavy rail its in the heart of the historic downtown area, then a more suburban light rail line can feed into that. crazy. As I recall, the owners of Plaza Las Americas (Puerto Rico’s biggest shopping mall) successfully fought plans to include a Tren Urbano stop there. That bit of NIMBYism really hurt the project. Well not exactly ‘fought the plans’. When the train was in the planning stages, the government went to the Fonalledas Family (owner’s of Plaza) and asked them if they wanted a station nearby the mall. The Fonalledas smugly said: No thanks; the people expected to use the train are not Plaza customer’s. They said ‘no’ only because the government expected Plaza to fork up the money for the station, when the rest had been at government’s expense. I would imagine they fought it because they (probably correctly) thought it would bring an increase in shoplifting. The real killer is that it doesn’t run through santurce to old san juan. if there’s anywhere on the island that is terrible to drive to, it’s old san juan. I would agree that tren urbano needs to run at least to miramar. Why on earth would transportation access make shoplifting more likely? I agree with J; until the Tren Urbano connects with key destinations, ridership will remain low. The extension to Miramar (if not Convention Center) coupled with light rail to Old San Juan will provide the system with access to places people want to go. Thinking further ahead, an extension from Old San Juan through Condado to Isla Verde would be huge for tourism and economic development. During a recent visit to Puerto Rico (mostly outside of San Juan), I noticed that it must be the most car-dependent places in North America. San Juan is the only city with any mass transit at all and most of San Juan makes Los Angeles look like a walkable paradise. It is unfortunate, because Old San Juan…the area of San Juan that has the most character, is very walkable. I wonder what changed? yes, Old San Juan is very walkable, but it is completely unrepresentative of the rest of San Juan and Puerto Rico in general. Well, like the mayor said in a video, it seems that the Spanish were able to plan their cities, why is it that after WWII all we build is unplanned developments aka sprawl. He emphasizes the development of a planned district and Puerto Rico will have its first “streetcar suburb” in more than 60 years. Yonah!!!!! I can’t believe you beat me to it! I’m writing a feature for Planetizen. I won’t even peak at your article until I’ve written mine. Cheers and thanks for blogging about it! govind, puerto rico is just as transit poor as most Caribbean islands. San Juan itself has decent transit, via the guaguas, but the rest is too spread out and the terrain not that great for transit, same exact situation youd find in places like Maine, Idaho etc which I think are a much better comparison than LA. Actually, Hawaii would the best example. Sure, Oahu has “The Bus” but you’d be crazy to live there and not own a car. Danny, in the 1950s the government tore out the rail system and began to incentivize sprawl. They also stopped looking at the bigger picture. The issue of the transit developments in San Juan are very interesting. I think a few facts need to be considered which are not mentioned in the article, but need to be considered in order to fully contextualize these policy decisions in Puerto Rico. First, I should mention that I am a resident of San Juan, a very strong supporter of “Smart Growth” solutions in PR, and a “believer” in the benefits of massive transit, especially rail. In this context mayor Santini’s plans should be lauded and will help Old San Juan tremendously. However, this will bring spending on what is basically one, discontinuous (because of the change to tram at Sagrado Corazon), line to 3 billion dollars. Ironically, the new tram will not pass through the area immediately to the East of Sagrado Corazon (Barrio Obrero/Ave. Borinquen), a poor area, which is also the most densely populated area of all Puerto Rico. One has to question why no walkability or transport initiatives are be concentrated on that community an instead are being routed through new developments. Secondly, San Juan has not grown in population since the 1950s and the real city is a suburban mass extending from Dorado to Canovanas (West/East), and Caguas (South). Many low income people commute by car over 45 minutes both ways in heavy traffic. Might not a system of BRT worth 3 billion (which I assume could have bought various lines) have had more impact given our geography? Its just a question. Furthermore, the Commonwealth sponsors NO intercity transport, and there are no fixed bus lines between different areas of the Island, despite its small size and high population density. Ponce (pop. 250,000), Mayaguez (Pop. 100,000), Arecibo (pop. 100,000), etc. have no state or municipal public transport beyond “trolleys” (http://travelandsports.com/ty.htm). Finally, the local bus service AMA is limited, runs on an outdated fleet, and has very infrequent service outside of peak hours. I’m sure the municipality is aware of all of the above-mentioned factors, but one has to ask if the 3 billion dollars spent on this line will have been the most cost-effective use of public transport funds. Nevertheless, I like this project and wish it success. I just don’t want it to opaque these other issues. IF you built the BRT with separate right of way, so that the buses didn’t get stuck in traffic, then it would have cost more to build a “BRT” system which just covered the same length as the existing Tren Urbano. IF you didn’t build the BRT with separate right of way, the buses would get stuck in traffic, and the results would be dismal. It’s always the same. The only way to really get results “on the cheap” is to kick cars off of *existing* roadways. If *that* was done in order to make “BRT”, that would have gotten fairly good results fairly cheaply. But kicking cars off of roads in favor of buses is practically impossible to sell. “Light rail” in pedestrian malls is the closest to that you can get and still convince politicians and people to support it. @Peaton Agree with most of what you have to say. However, as another resident of San Juan, I notice that you speak the same way most other people in the city do (which is the reason for why public transportation has been hard to implement here). Right now, I live in Miramar. I dont have a car. I work in Cupey. I go to Golds Gym in Hato Rey. I just got back from Plaza. No problem about it. Most AMA buses run fine. especially in the city. I have never had to wait more than half an hour for any bus in San Juan. Outside of the city, or in the suburbs, transit can get tricky, yes. The thing is that people dont ride the buses so they dont know. Metrobus is amazing. It comes every 5 minutes during peak hours. Secondly, there is intercity transit, but it is not the best. It is, however, average. Not endorsed by the gov’t (which it should be) there are publico buses that run from city to city, several times a day. Most leave from Rio Piedras. But, this is not very different from the (organized) Peter Pan or Greyhound buses in the US. Several times a day, not all that clean, but way more expensive. Again, i agree with most of your points, but i have been very happy with the public transportation where i live. It’s not NYC, but if i lived in Houston, for example of another sprawling city, it would be worse. Try coming back to Santurce, even on M1, after getting out of work at 730-830 in Hato Rey. Try getting from Carolina to San Juan on Sunday. Its not easy. Miramar is fairly central, but from my time without a car I can’t call Metrobus amazing. Maybe my frame of reference is tainted by Europe, but my experience with las guaguas de la AMA has never been positive. The problem is that the service is erratic. I will agree that if you are in Miramar, Santurce, OSJ, or Hato Rey during working hours the bus service is fine, and people (especially middle class people) are too stuck up about it. What intercity transit are you referring to, la linea sultana? Hardly any towns have bus lines with regular schedules. I can’t agree with you that there is even average transit between any regions of PR. The publico system may have worked at some point, but it is broken. A typical experience is showing up and having to wait 3 hours while it fills up. Maybe Houston is worse, but I don’t agree that PR is acceptable, especially given the population density of the island, and how expensive car travel is for most residents here. i am so fatigued and stressed by all the automobiles on this planet. we should have class action suits against GM et al and governments that support these corporations. Second, the Tren Urbano was originally going to have 4 lines, Line 1 (the backbone) from Bayamón to Minillas, but that was never finished and ended in Sagrado Corazón, a line to Old San Juan, a line to Isla Verde and the airport and finally a line to Carolina through 65th Infantry Ave.
Third, I would like to remind you the plan is sponsored not by the Commonwealth or the State, but by the municipality itself. I remember back when Fortuño became governor he wanted to kill the light rail and Santini fought his every attempt. Also, don’t forget that the State scrapped all the Tren Urbano extensions for BRT’s. The extension to Old San Juan is still there because of Santini. This whole plan is to repopulate San Juan’s core so it wouldn’t surprise you that Santini is promoting this over BRT. I know the city (and not the state) made Ave. Borinquen a whole lot more walkable recently. When I referred to a single 3 billion dollar line, I was being figurative. Maybe its not fair to lump the light rail project with El Tren Urbano, but when implemented, the effect of this will be a single line from Bayamon to Old San Juan (somewhat in the shape of a very wide U). I think its necessary to reflect on the Federal/Commonwealth/Municipality resources these projects have used, and compare them with the absolute lack of transit options for most parts of the Island and the Metropolitan Area. I understand and like the ideas in the proposal for redeveloping the Santurce/Puerta de Tierra corridor. Walking around Puerta de Tierra (or more honestly driving through), my daydreams are not far off from the mayor’s vision, although I have to agree with The Transport Politic that the loop around Isla Grande is odd (why not a quick connector bus?). Plus, I agree with Yona that Santini’s coordination of transit and a development vision is very encouraging. Nevertheless, I am concerned about the long-term effectiveness of spending such great resources on a single line when the rest of public transport in SJ is so underfunded. What is the funding status for this project? I’m not familiar with any real pedestrian improvements on Ave. Borinquen. Its great that the mayor is taking them on. I have not been in the area over the last few months. What has been done? In that area I am only aware of the ENLACE/Cano protect (not well represented by its web-page (http://www.martinpena.org/)) , which was a Commonwealth initiative, sponsored in large part by PR DTOP, but that now seems out of favor. The present route still begs the question of why it does not run through Barrio Obrero when it would be a natural extension of what is being proposed. P.S. I like the Art Deco site. Nice work! John W-because it brings people, many of modest means or less. It’s a fact of life. they just opened a new line in santiago and shoplifting is up. Does that mean they shouldn’t have done it, but I can see that as a rationale for Plaza las Americas. Anyways, peaton-I’ve oftened wondered why there is no intercity bus service. Perhaps it’s because, as I saw elsewhere, it takes years to launch a new business, esp in the tourism sector. I’ve often thought about launching an intercity bus service terminating in old san juan making maybe two stops in san juan (one at the airport) on the way to ponce. I don’t live there, my wife is from there, and if PR gets it’s fiscal (and transportation act) we may move there. I think intercity bus service probably makes the most sense in the nearterm. Presumably it also brings more shoppers as well! The question is, does the shoplifter to customer ratio change? Or the ratio of shoplifting losses to sales? If shoplifting rises by 10% but sales rise by 25%, there’s not too much to complain about. Do you have any statistics to back up this ‘fact of life’? It sounds a bit like when they do surveys about people’s perceived fear of crime, which can show an increase (presumably due to media sensationalism) even though actual crime stats are down. I do not live in San Juan but I used to work there before Tren Urbano opened and I visit yearly so I’m familiar with the system. One question, does anyone trying to get to OSJ from points along the train’s route ever transfer from the Hato Rey station to the Acuaexpreso terminal? I did it once last year and it worked very well. The ferry runs frequently enough so it’s feasible, the trip is only 15 minutes and the cost is only $1. Granted, you might think it’s not frequent enough (running every hour) but, if you plan your trip smartly, you can time the transfer easily. I just recently heard the cost for TU dropped to 75 cents making the total cost $1.75. I currently live in Chicago where one trip without transfer costs $2.25 and many people, like me, have to make at least one transfer to get to work. Doesn’t this solve the problem of getting to Old San Juan from anywhere along the train’s path? The Netherlands has the best Light Rail system in the Heart of the City that serves both tourists and Locals. Puerto Rico should model its lightrail after the Netherlands system. I really wish they would have built the Tren Urbano coming into the San Juan Metroplex from cities such as Ponce, Cayey, Caguas. I believe the investment would have been smaller and the revenues much greater. After all, who wants to have to drive from so far away and then park their cars just to take the Tren Urbano for a short trip around the general San Juan area? People really want to avoid the famous “Tapon” and would gladly pay not to have to get caught in it.The greater revenues could have then been used to create an intra-city rail system. But then, what do I know? I think that the idea of a “light Rail”for San Juan,as proposed,is a very good idea.In order for this project to be successful,the fare charged should be reasonable. I hope that the fare paid at this facility will not be as ridiculous as the toll that is actually paid at the “Teodoro Moscoso” bridge. I agree with Robert Quintana. This projects are strictly politics and ways for this “cheap crooked politicians” to funnel money through the phony corporations to bleed dry the People of Puerto Rico and bring the credit line to junk status. There is an excellent alternative form of rail transport that will bring equivalent service to all proposed extensions to Tren Urbano (and should be considered for all future projects everywhere). This is hydraulic powered overhead monorail. The basic cross-sectional dimensions are similar in height, but much more compact than heavy rail elevated systems, and are far less expensive to build. Thus a given amount of money will buy about twice the distance of transport. During construction there is very little disruption of commerce or transportation, since all that is installed in the ground are the pylons that support the overhead track. The sections of rail themselves are trucked in and installed at night to avoid disruption of commerce. It may be possible to load and unload passengers at ground level where space permits, greatly reducing the size and cost of stations. These systems are far simpler and about half as expensive per mile and per vehicle. The maintenance is much simpler and the fuel cost is radically less – about 70% less. Most of that saving in energy used comes from the very large recovery of energy during braking. A hydraulic system recovers between 70% and 80% of the energy. Since the cars hang from the overhead rail, they do not need to be built to carry and ride on massive trucks with heavy electric motors. Thus the cars are about half as massive, and the motors which are about ten times as energy dense (and therefore much smaller and lighter than equivalent electric motors) fit easily into the wheel pod that rides on the track and supports the car beneath. Energy storage is in a pressurized tank that forms the backbone of the car. Since the entire vehicle is much lighter, the amount of energy needed to accelerate and decelerate it is significantly smaller. No heavy electric system is needed on the track. The cars rapidly recharge in the stations while loading and unloading passengers. Lighting is provided by on-board batteries. This drive system will also work for surface transportation, and is being developed as an alternative to electric vehicles. The lightness and simplicity apply there as well, with an equivalent hydraulic vehicle running much lighter and much less costly, with greatly simplified maintenance and extended durability. Their performance is equal or better in terms of acceleration and range, since they carry an on-board engine of extreme simplicity and sophisticated design (double acting free piston) that recharges the accumulator (energy storage tank) as needed.